Guyana’s unique geographical location on the North Atlantic coast of the South American continent has many benefits including being accessible to water transportation such as cargo, luxury and other vessels. November 26, last year was the last time the major garbage removal contracting companies withdrew their services from Georgetown, citing non-payment of huge outstanding sums of money and following a nauseating pattern that has unfolded for more than a decade. While the rest of the world is still busy adjusting to the commencement of the New Year, the Consumer Electronics Show (CES), the world’s largest technology convention kicked off last Sunday in Las Vegas, Nevada, with most of the world’s leading electronic giants holding press conferences to announce their latest innovations. So it seems that we may be on the verge of a Code of Conduct for the minibus industry which, if it can be suitably crafted and effectively implemented (and those are big if’s) can go a far way in raising standards of public order and significantly improving customer service in one of the most important enterprises in the service sector. After dispensing with the savings clauses and symbols of statehood, the Constitution of the Co-Operative Republic of Guyana gets down to the nub of its primacy. Last week everyone’s attention was riveted on the consequences of the no-confidence vote and the scheduling of Parliament at a time when the government was expected to have resigned. Fifty years ago, when Ruth Bader Ginsburg attended Harvard, the dean of the law school would meet with female students once a year. In an age of growing e-commerce and increased internet-based communications, the local postal service, the Guyana Post Office Corporation (GPOC), remains a vital institution serving communities across the country, no matter how small or remote. It may be that the final figures will be tweaked a bit, but it is estimated that for Christmas 2018, shoppers in the United States spent roughly US$1 trillion, while those in the United Kingdom spent over £2 billion. Venezuela, over the years, would have been monitoring closely both the exploratory work by ExxonMobil in its search for what, as it turns out, is Guyana’s huge reservoir of oil reserves, the various oil finds that have been realised since around May 2015 and now the unfolding plans for the start of the oil recovery exercises which are imminent and which can transform Guyana’s economic fortunes in the period ahead. As the year comes to a tumultuous end, it is now up to President Granger to show leadership and to demonstrate that the country and constitutional governance will be put above all else – particularly the insular interests of APNU+AFC. The course of changing government in Guyana never did run smooth, and true to form we now find ourselves in the middle of another political transition muddle, this time of a possible legal variety. As this year draws to a close, America’s volatile stock market seems a fitting image for our likely future. This is the time of the year when giving is at its peak. With the fractured political climate that exists in Guyana, it becomes extremely important that common ground is actively pursued, concretised and expressed in the form of policies through the National Assembly. There is little peace and good will in the political arena this season. Friday’s vote in the National Assembly by APNU+AFC MP, Charrandas Persaud has triggered the fall of the government. The sudden resignation of US defence secretary James Mattis is another depressing milestone in President Trump’s chaotic misrule. The announcement one year ago by the Commissioner of the Guyana Lands and Surveys Commission (GLSC), Mr Trevor Benn, of the preparation of a National Land Policy was a welcome one. About a week ago, a story went viral online about a woman who drank a litre of soy sauce in an hour, a purported attempt to cleanse her colon and ended up brain dead. The Letters to the Editor column in this newspaper since its inception thirty odd years ago has been an outlet for readers to vent their feelings and thoughts on all manner of subjects ranging from blackouts to road construction to minibus drivers to the salaries of teachers, to mention but a few. 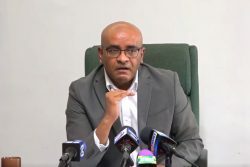 There is no mistaking the uniqueness of Bharrat Jagdeo as a Guyanese politician and public figure. It has been a particularly testing last couple of weeks for leading Chinese telecoms equipment provider, Huawei, underlined by the dramatic arrest in Canada of its Chief Financial Officer, Meng Wanzhou, pending hearings for extradition to the United States over Iran-linked transactions with multi-national banks. It was reported by Reuters on Tuesday that two Russian TU-160 supersonic bombers, also known as ‘White Swans’, had landed in Venezuela the day before. For its 2018 Person of the Year award, Time magazine has chosen a group of Journalists which it designates as “The Guardians.” Among them are Jamal Khashoggi, two Reuters reporters imprisoned in Myanmar, an arrested Philippine journalist and the staff of a Maryland newspaper – The Capital Gazette –in whose offices five people were fatally shot in June. There has been much talk over the years about the importance of achieving social cohesion in Guyana, particularly since the current administration put in place a Ministry of Social Cohesion intended to advance social cohesion among the various racial and cultural groups in Guyana. On November 18, this year, six people were killed in Haiti during an anti-corruption demonstration, which saw thousands of protesters marching in the capital Port-au-Prince and other parts of the country. Two Saturdays ago, on 1st December, Meng Wanzhou, the Chief Financial Officer (CFO) of the Chinese telecommunications giant Huawei, was arrested in Vancouver, Canada. There are times when it takes an opinion that is detached from what, all too often, is our rumbustious political culture to voice truths about important national issues, we ourselves being too immersed in our prejudices to muster the honesty to speak objectively. Two weeks after her offensive declarations on November 25th at a PNCR Region Four meeting, the words of party chairman and Minister of Public Health, Volda Lawrence warrant continued attention particularly as the government has not held her or itself accountable for her behaviour. As we draw closer to 2020 and national elections, the calls for shared governance have increased. On September 14, 1987 the Sunday edition of the New York Times ran to a record 1,612 pages and weighed 12 pounds. Disaster Management can be defined as “the organization and management of resources and responsibilities for dealing with all humanitarian aspects of emergencies, in particular preparedness, response and recovery in order to lessen the impact of disasters.” Guyana has been extremely fortunate, through a favourable mix of geographic circumstances, to not have had to deal with a really serious natural disaster to date. The furore over the statements made by PNCR Chairman Volda Lawrence is likely to follow her for some time to come. The thirteenth meeting of the Group of Twenty (G20) was held last week Friday and Saturday in Buenos Aires, Argentina, the first time that the group has met in South America. There are things about the findings of the Commission of Inquiry (COI) set up to probe the administration of City Hall that are acutely disturbing though, frankly, not altogether surprising. As budgets go, the $300.7b one presented by Finance Minister Winston Jordan last Monday isn’t much different from its predecessors or indeed those of the previous government in their main constructs. In this country, people are rarely surprised by what their politicians say. In our rigid party system, we are accustomed to hearing all kinds of infelicities issuing from their lips. Earlier this week President Trump’s former lawyer pleaded guilty to giving false statements to congress about his client’s ties to Russia. It is now an all too familiar dance: The City of Georgetown employs waste disposal firms to collect the City’s garbage, the City winds up owing enormous sums to these firms, who then switch partners and call on Central Government to join the dance, and after being sufficiently appeased by government payments, these firms return to the welcoming arms of the City Council. Pick a day. Any day. And then check the global statistics; you will find that more than 100 women were murdered by their husbands, partners or family members. Last week six boys attending a very prominent all-boys private school in downtown Toronto were arrested and charged over a hazing incident which had taken place within the confines of the school. On Thursday October 25th, close to two months after being named as the country’s Police Commissioner, Mr. The disclosure that ExxonMobil’s Final Investment Decision (FID) for its Liza Phase-2 well has been delayed to enable a careful examination by the government of its Field Development Plan (FDP) is a welcome development. There were three distinct markers about the 2018 local government elections that poll watchers and analysts will be mulling. Last month the United Nations estimated that up to 13 million people could starve in Yemen if the Saudi-led coalition prolongs the country’s civil war. With the coming on-stream of the Anti-Money Laundering & Countering the Financing of Terrorism (AML/CFT) Act, day to day banking has become an increasingly complex and time consuming affair for regular customers in Guyana. As recent as April and June this year, three Guyanese were arrested at the John F Kennedy Airport in New York with a total of 34 live finches that they were smuggling into the United States to later sell for lucrative sums of money. The ICC Women’s T20 World Cup currently being hosted by the West Indies has reached the semi-final stage with the two matches scheduled for tomorrow in Antigua. Early in October an unsigned letter purportedly authored by “Members of the Parent/Teacher Association” of a named state secondary school (since the letter was unsigned we have no way of vouching for its authenticity or otherwise) and addressed to Education Minister Nicolette Henry (and copied to three other Ministers) surfaced, ostensibly complaining about a host of irregularities at the school.